Made using the Alyeska WordPress theme. I made a website for Dr. Victoria Morrow in 2010 with hardly any SEO knowledge. In 2015, I updated her website, giving it a modern, responsive look. Using my newfound SEO knowledge, I paid extra attention to on-page SEO (header tags, meta tags, etc.) 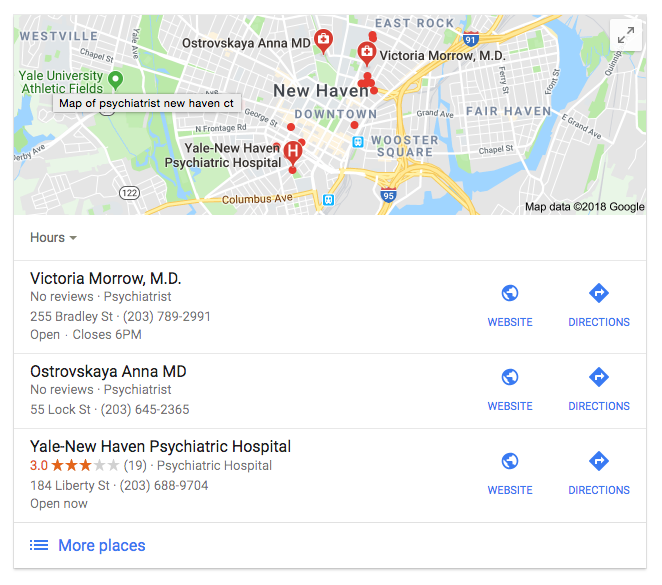 and updated the Google listings for both of her practices (New Haven, CT & Westport, CT). I also submitted her listing to a variety of medical & physician directories. 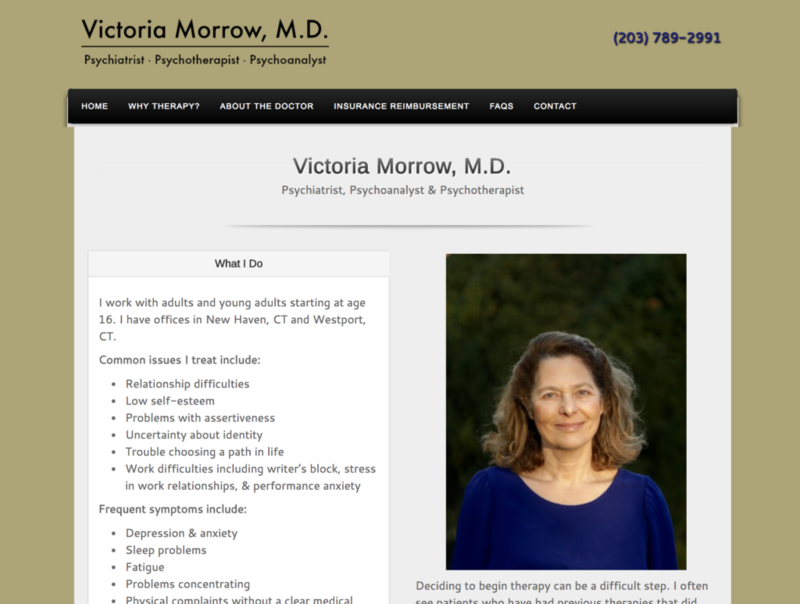 A year later, I spoke to Dr. Morrow and asked how she was liking her new website. She said, laughing, “I love it, but now I have the opposite problem. I get too many calls!”. 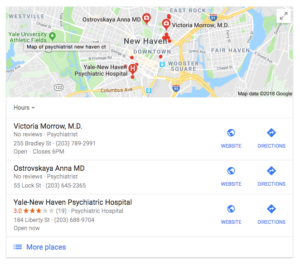 A few days later, I Googled “psychiatrist new haven ct”, with and without quotes (and in incognito mode). I was shocked. Dr. Morrow’s website dominated the first page of Google in 2 ways! 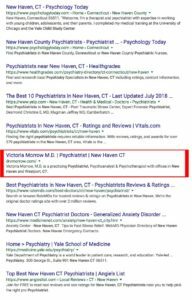 The other 1st page results are physician directories and Yale-affiliated websites, all with much higher domain authorities than my website! 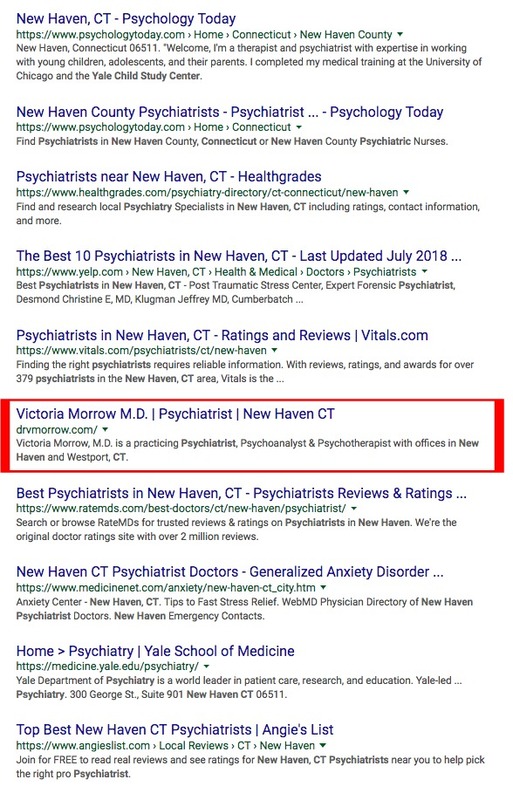 For a scale of reference, Yelp has a list of 60 psychiatrists in New Haven. Yet, Dr. Morrow is the only one who is mentioned on the first page of Google. Research shows that websites on the first search engine results page receive almost 95% of web traffic, leaving only 5% for remaining search results pages.